On Sept. 11, 2001, Eric and I were only friends and I was a sophomore at a small college in West Tennessee. Like most others who can recall that far, I remember exactly where I was when those planes hit the World Trade Center, the Pentagon and the field near Shanksville, Pa. Almost 15 years later, I was standing on the hallowed ground trying to comprehend in my mind what it must have been like being at Ground Zero on the day that our nation changed forever. However, I must note that in addition to those killed in New York, D.C. and Shanksville in 2001, the museum also honored those killed in the World Trade Center attack on Feb. 26, 1993. We walked the memorials outside and it was interesting to see the gambit of reactions from people. There was the person crying and touching a name, someone who ran fingers over the name (almost as if saying a quick prayer) and someone else who, like me, was just trying to process what it meant to be in that spot. However, I did get slightly angered to see some international tourists who were smiling and taking selfies because it seemed rather disrespectful in my eyes. How can you smile when nearly 3,000 people lost their lives on that very day? After walking around, I noticed that there were flowers sticking out of some of the names. My mind instantly concluded that these were placed there by loved ones visiting the memorial, but I was wrong. As a matter of fact, the flowers were to honor a victim on their birthdays. 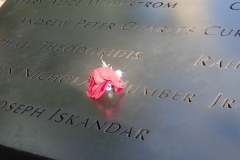 For me, this was my second 9/11 memorial; for Eric, this was his third — and last — site to visit. He was with me when he toured the Pentagon shortly after we moved to D.C., but had visited Shanksville when he attended a motorcycle rally a few years ago. Walking into the museum, we were kind of put off by some museum employees who were joking around. We get it; you’re here everyday, but please be respectful of others who are coming here to pay their respects. After that little hiccup, we proceeded down the escalators past the first piece of twisted metal that reached almost to the ceiling. 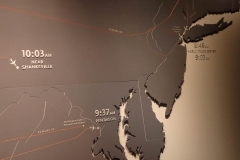 On the main floor of the museum, we passed by a map that showed the time frame of that day’s events, followed by broadcasting of folks recalling where they were that day. 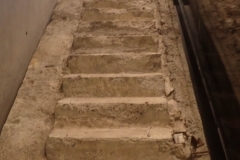 I immediately started tearing up, and as we got to the survivor’s stairs, I was almost losing my composure. Yes, I saw the news feeds, videos, photos and all that had been written about the day’s events, but to actually see it in person was overwhelming. The museum posed questions that were beautiful but were interpreted differently by almost everyone. On one wall, with a quote from Virgil, was all these shades of blue. People who personally experienced the events of 9/11 in New York were later asked, “What was the color of the sky?” It was amazing how many different shades of blue there were and how everyone recalled the same sky in such varying ways. Aside from all of the mementos (wallet contents, fire trucks, police cruiser, jackets, clocks, phones, etc.) on display that day, there was a room of photos for every one of the victims. A handful of people did not have photos (remember, this was pre-social media) so they are recognized with an oak leaf; if you know someone who died in either the 1993 or 2001 attacks and have a photo of them, please contact the museum. The photos were also used in a broadcast loop of loved ones telling about the victim’s life, and that tugged at my heartstrings, and recordings can be made as well. A word of warning: There is a portion dedicated to the Shanksville attack that can make even the strongest person weep. Since this one had an in-tact black box recordings from the plane, they displayed the series of events, including outgoing voicemails to loved ones from those on the plane. The hope-yet-despair in their voices still brings tears to my eyes and will forever be ingrained in my mind. These folks hoped they would make it off that plane alive, but most knew deep down that they were going to die. I could go on for days about this museum, and we still didn’t see it all. If you’re in New York, make time to tour the National 9/11 Museum. I don’t want to say that this was my favorite part about our trip to New York, but it was certainly a part that made the most impact.